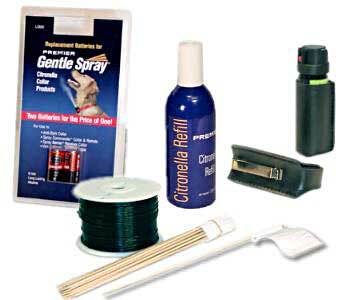 The Citronella Refill and Replacement Batteries can be used with the Gentle Spray, Spray Commander, Spray Barrier or Virtual Fence products. You can also purchase a refill for the SSSCAT automated cat deterrent. The Holster will help you keep DirectStop handy when you are running, biking or out walking with your family. Additional Wire and Flags are available, if you have more than a 500 ft. area you want to cover with the Virtual Fence system. Everything you need to keep your spray products operating, without a trip to the store!